"Every ant has his day." A computer animated film that features the voices of some major Hollywood starts including Woody Allen, Sharon Stone, Sylvester Stalone, and Jennifer Lopez, among many others. The setting is an ant colony outside of New York City. Z is a worker ant that wants to be able to freely express himself. Z ends up meeting Bala who is an ant princess who is trying to escape her royal family. They end up falling in love. In order to be around Bala , Z joins the ant army. The General of the Army named Mandible is sending the ants to die so he can take over. Z is the only ant that does not die in an attack by termite. Before dying one of his friends reminds him to think for himself and follow his own life path. His choices to rebel are spread in the ant colony. Mandible sends one of his soldiers to kill Z but he starts to have different thoughts and does not follow through. Bala is staring to have feelings for Z but is returned to the colony. He learns that a tunnel being built by Mandible leads straight into water with the intent to kill the ant and the Queen. While trying to warm everyone the water comes and the ants are sent to the surface. Mandible tried to kill Z but is saved at the last minute. Z is regarded as being a hero and is able to marry the Princess. They are able to rebuild the ant colony and allow the ants to choose their own path of life. The state of conformity of the ant kingdom has ended with the new rulers. This movie is meant to be fun and entertaining for children while passing on important social messages to the adults. 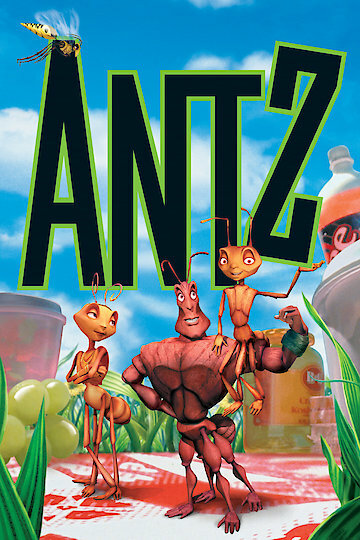 Antz is currently available to watch and stream, download, buy on demand at Hulu, Amazon, Vudu, Google Play, FandangoNow, iTunes, YouTube VOD online.